Millions of people are making are a foolish mistake online. Could you be one of them? Building an audience on social media offers huge potential. But it can also be dangerous. Well, it can be dangerous if you ignore one simple fact. What is it? You need to dedicate your time and energy on building an audience on your own website, and focus on driving traffic to that site. Not to your Facebook Page, or your Instagram account, or even your live videos on Periscope. So, you need to focus on driving traffic to your website. But how do you do that? 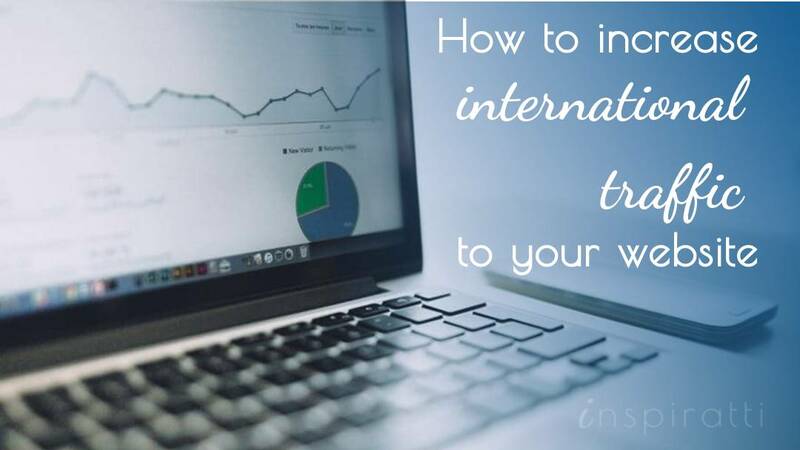 In this article, you’ll learn how to increase international traffic to your website. I’ll share a 3-step process and techniques you can implement immediately. Understanding global traffic patterns and your existing traffic performance is essential for increasing international traffic to your website. Let’s start by considering the important background research that you need to conduct. Start by assessing global and country-specific trends. Consumer Barometer enables you to understand how people use the internet across the world. You can use it to better understand demographics, internet penetration, device usage in your target markets, and other important questions for traffic generation. Google Trends is useful for identifying the countries ranking highest for searches of your keywords. Does your current strategy help you to rank for important keywords in your target market? Conduct a quick analysis of your existing traffic. Google Analytics provides a helpful overview of where your traffic is coming from in terms of regions, countries and languages. Are your traffic sources scattered from around the world, focused in specific regions, or purely domestic? Where is most of your traffic coming from? Ask yourself why your visitors are coming from these places: is it because the content is targeted towards their needs, or because you targeted promotional activity to those places? This quick analysis will provide a strong foundation for content creation which plays a critical role in driving international traffic. Assess mobile usage of your visitors. Is your traffic coming from countries where mobile usage is particularly high, or is desktop still the preferred platform? If you want to attract a truly global audience, creating a mobile responsible website is crucial. According to StatCounter, the use of mobile devices to access the internet has increased by 67% worldwide over the last 12 months. “Mobile usage has already overtaken desktop in several countries including India, South Africa and Saudi Arabia” (Aodhan Cullen, CEO, StatCounter). After taking stock of the traffic situation on your website, you are now ready to start creating content for your site. Take these points into account to ensure that you produce content that attracts an international audience. Craft messaging that meets the specific needs of the international markets you are targeting. To get started, review the pages on your website and ask: Will your sale pages persuade your target audience to buy? Will your ‘about page’ intrigue them? Will your ‘FAQ page’ answer their most important questions? Often B2B products travel better across borders than B2C products as they lack the emotional connection. So, whilst adapting your content for buyers of industrial equipment would generally not be necessary, adaptation would usually be needed for consumer goods such as food. Carefully choose the top keywords for which you want to rank highest in Google. Avoid generic, all-encompassing keywords; the intense competition means you’ll struggle to compete. You should be looking for keywords that generate the most searches and the least competition. Identifying the best keywords requires detailed keyword analysis. You can filter by ‘location’ and ‘language’ using the Google Keyword Planner to find out how many people are searching for your selected keywords in the regions you are targeting. Kissmetrics offers additional tips on how to internationalize your SEO strategy in this infographic. Evaluate the costs and benefits of translation. Gal Nissani argues that translation is the most important step you can take to attract potential clients. Research by Harvard Business Review found that 72.1% of consumers spend most or all of their time on websites in their own language and 72.4% of consumers would be more likely to buy a product using information in their own language. Ultimately, the decision to translate will depend on your objectives and budget. Translation would be imperative if you are targeting a mass consumer product in a country where most of the population do not speak English. If you are unsure whether to invest in translation, select the language most likely to deliver the highest return on investment, start translating sections of the website, then see what happens (Kissmetrics). If it has a measurable impact on the traffic you get from that region and on other key metrics, you could consider scaling it to other languages and sections of the site. Publish a blog on your website. A regular stream of high quality blog content provides the juice Google craves to rank well in search engines. It also helps you drive traffic from social media as people start sharing your interesting blog posts. Once you have the content in place, you’ll start driving traffic naturally through the boost in SEO you’ll receive. But there are some additional promotional tactics you can use to increase traffic to your website. Use carefully targeted paid advertising. Do some background research before investing in paid advertising to maximize your chances of reaching your target audience. You need to find out where your audience spends time online so you can identify the best platform to use. You also need to know what motivates them so you can select the right keywords. Get started by considering these questions: What are the biggest social media networks in the country you are targeting? Where does your target audience spend most time online? Once you have worked this out, you can work on creating a compelling offer to lure people away from social media and onto your site. A free incentive where people give their email in return for a free gift usually works well. Once you have their email, you can continue to engage them through email to bring them back to your website. Engage with local-specific social media networks. Find out what the most important social media network is in the geographical market you are targeting, then start establishing a presence on that network and share quality content from your site. Remember, that each social media network is different so research best practices of the specific network, and ensure you oblige by them to avoid common blunders committed by newbies. Engage key influencers in the country you are targeting. Maximize the effectiveness of your campaigns by choosing influencers relevant to your product and are genuinely interested in promoting it. They should also hold some prestige or at least be well-liked by the local audience. Building up assets you control, including your own website, is time well spent. But you need let people know it exists. So, promoting your website with an effective traffic generation strategy is also crucial. In a globally connected world it is essential to take an international approach to your traffic generation strategy. Studying overseas search trends and developing targeted content based on these observations will enable you grow a larger and more international audience. Following the process outlined in this article will help set you on the right path. But to succeed, you should follow the whole process and not take shortcuts. Why? Careful analysis feeds into better content decisions. And better content drives people to your website, who are eager to read your content and share it with their network. Before you know it, you’ll have built up a readership of people who return to your site to see what new things you have to say. So, get ready and start driving traffic to your site. Do you take a global perspective in your traffic generation strategy? What strategies do you use to drive international traffic to your site? Share your ideas in the comments below. Enjoyed this post? Follow me on Twitter @laucocos to get my latest updates on digital marketing. Wow, well written article. I think this type of information is valuable for many people who have offline businesses as well as those who are starting online ventures. Good work! Delighted to hear you like the post. Let me know if there is anything else you would like me to cover. its a really good content Laura! i really find Google trends useful as my coming projects requires international traffic. Thanks for sharing this. Cheers! wow wonderful article published here, I found this very useful and strategies explained here are very easy to implement on my website to Increase international traffic. I agreed with you and this is real and works also. Using Google Analytics, analyzing the traffic and optimizing website according to the traffic is the better idea to increase international traffic.